Earlier this year, Nightclub & Bar magazine published an article I wrote on the resurgence of vintage cocktail books and the bartenders who love them called Tools of the Trade: Jiggers, Shakers and Out-of-Print Books. This was just after Mud Puddle books, the EUVS (Exposition Universelle des Vins et Spiriteux) and others became known for reissuing these obscure, old volumes, whose original editions had been selling for crazy money online. We have crossed over to a new world now — a world in which David Embury’s The Fine Art of Mixing Drinks and Harry Johnson’s Bartenders’ Manual and Guide for Hotels and Restaurants can be had for the price of a couple of cocktails, if not entirely free. Much like I did with Boston-area bartenders a while back, I got in touch with a bunch of bartenders nationwide about their favorite old cocktail and bartending books, and whether they had ever spent big bucks on a must-have, brittle-paged tome of yore. Only tiny bits of their entertaining and thoughtful responses made it into the article. So, like any good blogger, I present here some outtakes, in no particular order, that didn’t make it into print. One thing that’s clear in both the print piece and the commentary below: everyone loves Charles Baker’s The Gentleman’s Companion, Vol. II (1939). But not for the recipes. To be honest, my favorite cocktail books are old cookbooks. Back then they had to plan entire parties just from one book — all the way from pairing the wine with the meal, bottle service, table set-up, carving out blocks of ice for punches, and even how to take down a whole cow from the field to the table. With my background of cooking for about 10 years, it was fun to go back to these old books that I had for that, and find traces of punch recipes from [Jerry] Thomas himself. 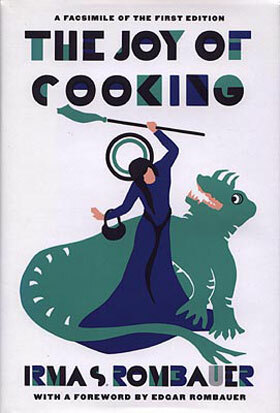 I say the Joy of Cooking, by Rombauer (1931). I should probably give you a general impression of how I feel about vintage cocktail books. I consider myself a professional bartender and am very passionate about what I do, but I’ve been eyeing the craze toward snatching up vintage cocktail books with a bit of skepticism. To me, the trend likens itself more toward the trappings of specific, hard-to-find antiques than it does to actually serving customers and expanding one’s craft. And then there’s getting all sociological with this. American bartenders are constantly being told that our heritage and heyday lie in pre-Prohibition cocktails, and that the time between the Great Experiment and the recent classics revival has been marred by crap. We find ourselves looking back desperately to a time when the barman deserved the respect and admiration of his community and patrons, so I think there’s a real need to acquire these books to, in a way, legitimize what we’re doing with this revival. 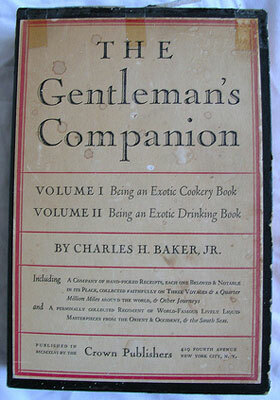 For me, the absolute best vintage cocktail book in my collection is Charles H. Baker, Jr.’s The Gentleman’s Companion. Would I ever use a recipe from this book? No way. For me, the magic is in the writing and the story telling. What I have personally gotten from this book? A more relaxed approach to cocktails. An ethos that says: this is just cocktails. Sure, they’re damn good cocktails, but really, we’re here in this bar enjoying our lives, enjoying the people in our lives, enjoying the spirits in our glass, and enjoying the world. My favorite is probably Charles H. Baker Jr.’s Gentleman’s Companion and his South American Gentleman’s Companion. While there are certainly some diamonds in the rough to be found recipe-wise, the real pleasure of reading those books lies in his inimitable prose. He drank with the best writers of his time and was surely their equal behind a typewriter as well as behind the stick. [While working for the Alembic bar in San Francisco], I looked on web sites that specialize in antiquarian books for Thomas’s How to Mix Drinks and found that at that time the first and second editions were going for around $1000. But one search — on half.com of all places — showed that among the slew of recently published ones for around $15, there was a seller listing one at $200. He mentioned some cover wear and pencil marks, and I just had a feeling about it — that he had an old one and had misunderstood how to list it properly. What came was the 1876 second edition, with some worm damage on the spine but otherwise in excellent shape. I held it and held it and held it, and ultimately sold it to Alembic for the purchase price, as my overdeveloped sense of morality told me that because I was searching on Alembic’s behalf at the time they should get it. I still feel ambivalent about it, though it is a real centerpiece of their library and is a real feather in their cap. As pedestrian as it sounds, I keep coming back to the Savoy Cocktail Book (1930). Its completeness is unparalleled, though I almost never use the recipes as they don’t tend to be delicious as listed. The most beautiful book I own is Still Life With Bottle: Whisky According to Ralph Steadman (1997). The most useful book, being the book that taught me what I knew nothing about, is Folk Wines, Cordials, and Brandies by M. A. Jagendorf (1963). The most unusual, yet useful, cocktail history book I have is Convivial Dickens by Edward Hewett and W. F. Axton (1983), in which all of the instances in which Dickens mentions or describes drinking in his fiction are extrapolated and explained, with modern equivalents for recipe experimentation. If a person is to have one cocktail book, and only one, I’d pick Joy of Mixology (2003). The graph section is the most useful innovation I’ve yet seen in helping people understand how drinks are related. [After Baker], the second book I pick up more than just about any other is not neccessarily vintage, but certainly rare and very much out of print. That book is called Cocktail: The Drinks Bible for the 21st Century, by Paul Harrington. This may very well be the most influential writing for me, as Harrington’s philosophies about cocktails most closely reflect my own. I know it’s only about 10 years old, but it’s quite rare and very much prized, especially among bartenders. I haven’t spent a great amount of money on any one book — I’m too much of a bargain hunter to put up with that. I’m also a total douchebag, so I like to scour the mom-and-pop used bookstores in small towns around Oregon, picking up gems for a song while they’re none the wiser. At least I never sell them for a profit. I did get into an all-out bidding war for an early edition of The Old Waldorf-Astoria Bar Book many years ago and can’t help but think that other person is now one of my friends, Paul Clarke or something. Marcos Tello, The Edison, The Varnish, L.A. 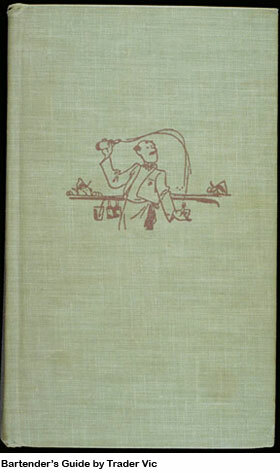 I actually have three favorites: Bartender’s Guide by Trader Vic (1947) — the recipes in this book are very similar to the modern breakdown of “classic” cocktails that many use today; Bottoms Up by Ted Saucier (1951) — there are a lot of great cocktails in this book, especially cocktails that originated from California; and the lesser known Home Made Beverages by Albert Hoskins (1891) — this book is a complete encyclopedia of syrups, phosphates, bitters, etc. Charles Baker’s Gentleman’s Companion series. I know everyone loves this one, but as a read it really brings you into a high-minded, romantic setting of drinking in the days of old. Verbose as Zelda Fitzgerald and humorous as the small fraction of good stand-up comedy. The needle in the haystack of cocktail guides. Partick Gavin Duffy’s Official Mixers Manual (1934). The intro itself is enough to make me love this book: “Bartending is an honorable trade. It is not a profession, and I have no sympathy with those who try to make it anything but what it was. The idea of calling a bartender a professor or a mixologist is nonsense.” YIKES! This guy is pissed off at someone. The recipes are fantastic, though — actually functional, unlike some other classic “guides.” Cool glassware diagrams as well as all drinks coded with their corresponding glass. I bet Wondrich likes this guy. Esquire’s Handbook for Hosts (1949). Hundreds of recipes that mostly work. Serves as connective tissue for someone looking for the lineage of classics. The illustrations are a plus. And the overall idea that this is a guide to throw parties, down to tone of voice and what not to say in mixed company. Civility with a little sexism — a look back into the mindset of old. Ted Haigh, aka Dr. Cocktail, L.A. I have a number of favorite cocktail books, though some of my faves have changed over time. Generally there is a specific characteristic of each beloved tome that hoists it up on my dais. For the shear joy of recapturing a past era’s less-traveled wonder at far away places with their strange-sounding names, I think all drink nerds will point definitively at Chas. Baker. It is mixology-as-literature, just as Hemingway is literature-as-mixology. I seldom make drinks from it — it is very uneven in that regard — but as a sip inducer, it sets the mood like no other. For inspiration courtesy of the best layout any cocktail book ever had, I go with an obscure little book named The How and the When by Hyman Gale, a bar guide first published in Chicago in 1937. Contrary to conventional wisdom, this is no wonderland of graphical grace like Harry Craddock’s Savoy Cocktail Book, or a gilt-edged beauty like Cocktail Fashions of 1936. It is printed on semi-gloss coated stock, with black ink, devoid of any decoration. What makes this book such an unduplicated joy to use are the concise two columns of recipes in simple type on each page. No hyperbole, no flourishes, just a drink’s title in one font larger, and a clear, easy to read recipe in smaller simple serif type below it. This is a book to ponder recipes in. They may have been published elsewhere first, but this is my favorite wellspring for their rediscovery. I’ve been at the forgotten cocktail game for a long time. As such, my go-to sources for unrevived cocktails change over time. Currently, I have three. One is nearing the end of its reign at the top, one is front and center, and one has only begun to be tapped. In that order, they are: Barflies & Cocktails by Harry McElhone (where I lavish my attention on the section of drinks about town by Arthur Moss). The next is the Waldorf Bar Book by Albert Stevens Crockett. Here you get a half-book narrative of old New York, and half recipes. Of those recipes, a vast number would today be considered variations (minute variations) on the classic Martini. Gin, vermouth (or none,) bitters (or none), where the entirety of the differentiation is in proportion, brand, type and, of course, name. These recipes, frankly, make this a hard book to browse with much enthusiasm, but the great secret is that, excluding those recipes, many of the rest are strictly uncommon and startlingly good. 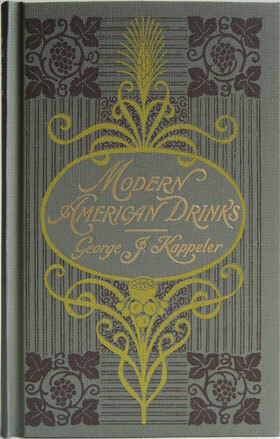 And the newcomer in this category is… Modern American Drinks by George Kappeler. To taste the 19th century, this is where I am beginning to turn. Of the books I cite, this one, from 1895, is the oldest yet. Yet, there is one older… my final fave. The vastly-titled New Guide for the Hotel, Bar, Restaurant, Butler & Chef by “Bacchus & Cordon Bleu” wins my quirkiest oddball drink book award. I’ll assert it is also the progenitor of that category. You see, not only does one make drinks from the recipes in this 1885 book, one makes the liqueurs — potions, really — that go into those drinks. No drink guide has ever been so arcane. So if you fancy a beverage prepared with Liqueur Excelsior, or perhaps Liqueur Criterion, this is where you must turn. 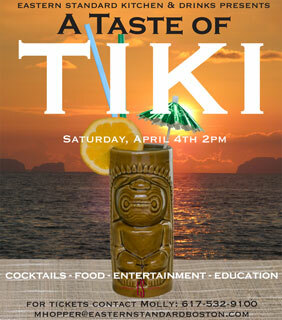 Dust off your lei, your hula skirt and your Don Ho loafers and join drinkboston and the Fraternal Order of Moai for a tiki party-urban luau at Eastern Standard Kitchen & Drinks on Saturday, April 4 starting at 2:00 p.m.
A roasted pig will be the centerpiece of a three-course luncheon of traditional Polynesian-American fare in the great Donn Beach/Trader Vic tradition. Three freshly squeezed, rum-soaked tiki cocktails accompany the food: a recent creation by Brother Cleve, who will program the exotica music soundtrack for the day and also give a keynote presentation on the history of Polynesia in both the U.S. and Boston; another tiki original by the Eastern Standard bar staff; and a classic recipe from tiki’s early era in the 1930s and ’40s. All the eats, drinks, education and entertainment are included in a ticket price of $50 per person. Tix can be purchased over the phone (617-532-9100), via email (mhopper at easternstandardboston dot com) or by stopping into Eastern Standard anytime between now and April 4. Hope to see you there!